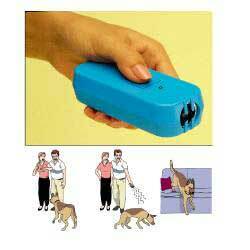 The Humane pet training method that uses effective ultrasonic sound. Uses High Frequency Ultrasonic pitch that only dogs and cats can hear. Teach your pet to: Sit, heel, fetch, roll over. Complete obedience training instructions included. May also be used by joggers, bikers, walkers and hikers to keep animals safely away. Effective up to 20 feet away. Battery indicator light show you its working.